This totem has the awesome honour of being a patron of Italian culture and the arts. I mean, in general, it’s an awesome bird – but did you know that something so tiny has inspired a lot of artists? What a wonderful, and overlooked, totem animal. Sharing your song with others, possessing a sweet voice, knowing how to persuade others, the pen is mightier than the sword, learning new ways of expressing yourself, respecting religious pathways, enjoying sacred spaces, adapting to significant changes to your environment, being fond of myths and legends, associations with St. Francis, connection to Italian culture and crafts, muse. The blackcap is a widespread, common passerine warbler found in Europe, western Africa and Europe. They are sexually dimorphic, and have a unique colour pattern for warblers. The male is grey with a distinct black cap, the female has a brown cap. They prefer to forage and hunt in shady woodlands, and nest in groundcover, preferring low shrubs. Their song is pleasant, chattering, with occasional clear notes; isolated blackcap populations can show marked differences in style and complexity of song. The blackcap is more hardy than other warblers, taking berries as well as insects when the weather gets tough. The blackcap is partially migratory, but recently some have been changing their wintering habits due to the availability of human food and gardens and recent environmental changes; the birds that are not migratory have higher survival rates than those that are. In some cultures, the blackcap is consumed as a food and considered a delicacy. 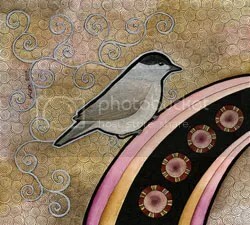 Blackcaps have long inspired Italian writers, who knew the bird as La Capinera. They are associated with St. Francis in the opera Saint Francois d’Assise.